Chicago Marathon 2018 – Train Consistently. Dream Big. My training for the 2018 Chicago Marathon really started last August after the World Long Distance Mountain Racing Championships in Italy. At that time, my coach John and I decided that I needed to go back to the basics and work on my speed, probably becoming one of the first runners ever to start with the marathon and then drop down to 5k races. We decided to make the Boston 5K my goal race. John was kind enough to include the Houston half marathon in January leading up to Boston where I broke the NB half marathon record by one second (1:17:07). I found the 5k training to be really difficult but put in the work over the tough winter months with my eyes on our ultimate goal, which was the Chicago marathon. Over the spring and summer months. I ran mostly trail and mountain races (including NACAC for Team Canada at Loon Mountain), with some road races as workouts to keep developing more speed and to try new things, such as changing up my fuelling and testing different warm-up routines. In the marathon build, which began in July, I did several half and marathon-paced workouts, progressing in duration each week, peaking three weeks out with 1hr 10 mins at half marathon pace (all done alone) and 90 mins at marathon pace (most of these workouts were done in races or with training partners). It was through these workouts where I started to really develop confidence that I could run under 2:40, as I ran multiple half marathon races across New Brunswick at marathon pace effort in under 1:20 (1:18-1:19) and felt very comfortable. The gem that I consistently have in every training block (that also consistently terrifies me) is the 8 by 8 mins at 15k pace workout, which starts earlier in the build as 5 by 5 mins and then progresses over the course of the cycle, which I completed (and survived) about midway through my build. While I know the workouts gave me confidence (and for sure fitness), I fully recognize that it was the consistent training day in and day out that prepared me to be in the best shape of my life. My easy runs were just that, easy (about 2 mins per mile slower than my marathon pace effort), and done mostly on trail, including Monday evening runs with the River & Trail Runners. Throughout the peak of my heavy training, I ran personal bests in all distances from 5k to half marathon, including 16:57 in the 5k and 35:57 in the 10k. Check out the results tab on this website for a more detailed overview of my 18 races in 2018. One change in my training from other training blocks is that we tested having three weeks up (higher volume) and one down (lower volume) from my usual two up one down and I responded well. We also increased my volume very slowly over the course of the year, peaking during my marathon build with most weeks including over 700 minutes of running. I strength-trained 3 days a week at Afterburn with support from my trainer Mike Tabour and could feel myself getting stronger with each new program, which was generally changed every eight weeks. I could sustain this level of training by ensuring I was fueling well (thanks to Liv9 nutrition and Nela’s Kitchen), taking one day off every week (Fridays), and also due to my amazing rehab team from Complete Balance for the preventative massages with Ang (weekly) and physio treatments with Colleen and Jess (mostly acupuncture/massage/stretching as needed) and Osteopath/Athletic Therapy treatments with Tara Jackson (weekly the month prior to the race). In the weeks leading up to the race, it felt each week that my training was building, as were my responsibilites at work. As a result, I might have left it a little too late to make sure I had a fresh pair of shoes for the marathon. About two weeks out, I ordered a pair of Salomon’s new Sonic RA PRO road shoes but, unfortunately, they sent the wrong size. I then went with plan B, which was the Saucony Type A as this is what I had been training in; however, after searching for about a week, they were sold out of my size in Canada. I had my friend Mel (who also ran Chicago) search around in Montreal to no avail. By Thursday I still had no shoes and decided I would have to get something at the expo, assuming the Type As would be there and, if not, I would purchase the Nike Zoom Vaporfly 4% Flyknit as it was announced that they were being launched at the expo. I had such a busy week at work (despite being on vacation) that I did not have time to process the fact that I was heading to my goal race - that I had been training for daily for over a year - with no shoes. The day before our departure, I was getting my luggage ready and realized my passport was not where I always kept it. I had just traveled to Ontario for work the week prior and for the life of me could not recall if I returned my passport to its usual spot. After searching for two hours, I started to consider that I would not be able to fly across the border and gave up my search for the passport and started to search for a marathon in Canada, with Marathon de Rimouski in Quebec being the top contender. I wondered if my husband Evan would still go to Chicago without me. Meanwhile, Evan had not stopped looking for the passport and eventually found it. He is even luckier to not have had to make the call if he would have gone without me. As a side note, it had been in our “junk drawer” where I had left it and it had fallen through the back of the drawer into the cabinet below, where I discovered a few other things that had gone missing. For those of you who read my blog from the Houston Half in January (sorry it has been so long since I wrote another), Evan and I missed our flight because we arrived after the boarding had already started and the airline had given our seats away to people on standby. We were determined to not let this happen again. We woke up at 3:30 am to get to the airport for 4:00 am to depart at 5:15 am with no checked baggage (for those of you who live outside of Saint John, we have a very small airport). Arriving that early is the equivalent of arriving at the Toronto airport five hours before boarding. The trip was rather uneventful, aside from the usual Air Canada delays. We went straight from the airport to the hotel to drop off our bags and then arrived at the expo in search of shoes and gels. We started with the Nike booth and just as we arrived (two hours after the expo opened) we were informed that they were sold out of the Nike Zoom Vaporfly 4% Flyknit shoes (I blame Air Canada for being too late, lol). I was extremely disappointed as I had made up my mind that these were the shoes I was going to wear in the race. I tried not to let it bother me too much and we went on a hunt to find the Saucony booth to get the Type As. We went up and down each aisle and once we turned the corner for the final row, I started to feel increasingly anxious. By the time we ended this row, I think I was having a full-on anxiety attack (still feel really bad for my brother who called at this very moment). It was setting in that I had worked so hard to get everything right for the marathon, from nutrition, training, etc, and I left out one of the most important elements of the race, my shoes! I then sat in a corner (tried not to cry, lol, and called every running store in the state of Illinois and surrounding areas that carried Saucony (list found on their website) and was not able to find the Type A shoes I was looking for. As a last-ditch effort, I went back to the Nike booth and asked if they knew anywhere in the state that had the new Nike shoes. He told me to stay put (which I did for 30 mins) and then he came back with the shoes. I was ecstatic! I had told him I was a men’s 6.5 (as the shoes are unisex). I tried them on and they were snug. He assured me that they are meant to fit like a glove, but they actually hurt they were so tight. I asked if he had one full size up and he came back 20 minutes later with the 7.5 shoes. I had a hard time understanding how I could fit in a men’s 7.5 when I am a women’s 8, however I bought them (came to a whopping $360 Canadian), and went back to the hotel. Later that evening I was walking around our room in the shoes and the 7.5 shoes still felt snug. I kept reminding myself that he said they will stretch out and are meant to fit like a sock. I did a short run in the hotel hallway and the shoes felt way too tight. I checked the size on the box and discovered he had sold me a women’s 7.5, not a men’s! Back to the expo we went to get the size 8, which fit like a VERY comfortable sock 🙂 . On Saturday, we did a shakeout run to test out the new shoes and to explore the start and finish of the race. We did 1 mile easy, 1 mile at marathon pace, 1 mile easy. We spent the rest of the day at the hotel working on our house plans (we are breaking ground next month), and checking the weather forecast 🙂. The morning of the race we woke up at 4:30 am, three hours ahead of the 7:30 am race start. We had our usual bagel with PB and banana. I was a little concerned about the weather as it was calling for humidity levels to be above 90% throughout the race, but tried not to focus on external factors out of my control. For the first time ever I was happy that there was going to be rain and a fair bit of wind, as I knew this would off-set the humidity. We left the hotel at 6:40 am to run to the start in the misting rain (you likely can’t depart your hotel 50 minutes before a race at many major marathons, especially not Boston!). I was seeded in a corral called the American Development Program. The start of the Chicago Marathon is divided in two at the start (with an actual divider in the road). The elites started on the right-hand side of the road, and we lined up on the left-hand side and I ended up being at the very front. I knew I was out of place here so I moved back to the second row. My daughter even spotted me on the TV at the start before the gun went off, which is pretty cool in a world major marathon. 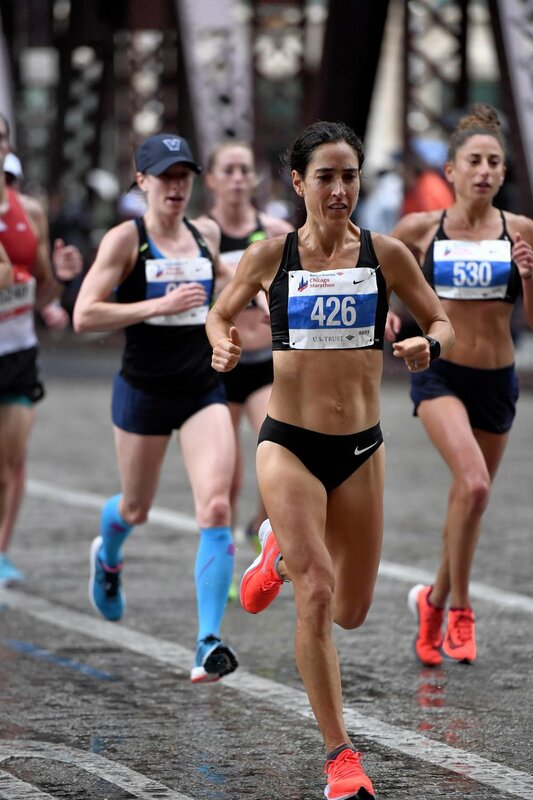 I was really happy to be so close to the starting line because I was going after the NB record and it is gun time that counts, not chip time, which I learned the hard way in Boston last year. Just before the gun went off, I looked back and saw a friend of mine from Ontario, Kate Toohey (wearing black hat in pic below). We had met in Ottawa in 2017 where we worked together in the 10k at Ottawa Race Weekend. I had no idea she was racing Chicago and when I asked her what she was hoping to run, I learned we both had the same A and B goals, which were to go under 2:40 as an A goal, and under our 2:45 PRs as a B goal. We decided to work together again, which we did for much of the race. Interestingly, I was surrounded by Canadian men at the start as well, which was a nice distraction as we waited for the gun to go off. In the first mile, it was incredible to watch the elite women and men take-off up ahead. I had to really watch my pace as I was so excited to see the pros, especially Galen Rupp and Mo Farrah, just up ahead. In what other sport do you get to participate with the pros in the very same event?! When I reached halfway at 1:19:24, I had banked 36 seconds toward my goal and felt so strong that I was confident I was going to run sub 2:40, but recognized that things can turn quickly so I held the same pace even though I knew I could run a bit quicker. I also wanted to stay with the pack, where we had a good rhythm going and I was feeling the wind in every direction we ran and knew it would be even more noticeable on my own. Also, we all shared the same goal of running under 2:40 and there was comfort in being in this company. At 25k, when the pack started to pick up the pace, I held on and ended up running a 37:01 10k from 25-35k. At about 35k our pack started to break up, with some falling off and others charging ahead for a strong finish, including my new friend Amanda Marino from New Jersey (bib 530 just above) with whom I ran most of the race and who crushed it in the final two miles. I opted to keep my even pacing as I feared blowing up when I was SO close to hitting my goal. With 5k to go, we turned north toward the finish, which was exciting, but this also meant we were running into a headwind and I was now running on my own. I pushed on and was given a major boost with 1 mile to go when I saw my coach John and he was so happy to see me! He told me that I was on pace for 2:38. My goal was to finish strong and I did not want to have to report back to him that I faded and ran a 2:39. This gave me the motivation to really push on, even up the final hill 300 metres out from the finish (often referred to as “Mount Roosevelt”), which felt tougher than Mount Washington at this late stage of the race. I could hear the cheering at the finish as I dug deep charging up the hill and then made the final left turn to the finish. I could see the clock had a 2 and a 3 (2:3X) and I did everything I could to get to the finish before seeing a 4 (2:4X) and ended up finishing in 2:38:49. As I finished, I saw Mo Farrah and thought he must have had a really bad day to be finishing close to me, but later learned that they were awarding the medals to the top place finishers at that time 🙂. As I do after every major race when my family is not there (which is rare), within minutes of finishing I called home using someone’s phone at the finish and celebrated with my family who had been tracking me every step of the way. From what I learned post-race, they were in good company with followers from across NB and Canada, which I am incredibly grateful for. Every mat I crossed, I was reminded of this support and felt you all there with me throughout the race. As for my nutrition during the race, I took one gel 30 mins prior to the race, and brought two with me, which I used at 35 minutes and 1 hour 15 minutes. At the 18 mile mark (1 hour 48 minutes) they were handing out gels so I grabbed three and took one then, followed by my fifth 10 minutes later, and then my sixth another 10 minutes later. Generally, I only take three gels, but the extra gels clearly worked! I drank at least one cup of Gatorade at every aid station, with 20 aid stations in total. While I am sure this slowed me down, it likely also ensured I did not blow up! At the end of the race, Evan and I had planned to meet at our hotel, which was 1k from the finish. When Evan returned, we shared experiences from our races, including Evan’s 7-minute personal best (2:53:41) and then went to meet up with my coach John, and teammate Mel and her parents for Chicago-style pizza. Mel ran a whopping 5 minute PB to finish in 2:34:08 as the first Canadian and 9th overall. It was amazing to hear about her experience running with the elites up front, and this has inspired me to keep training hard to maybe someday be at that next level. As if this was not enough excitement for one day, we ended it off at the Chicago Blackhawks home opener where the Leafs edged out the Blackhawks 7-6 in overtime, with 4 goals in the final 2 minutes of play! The next day, we did some exploring around the Chicago and went to a place called Chicago Recovery, which was like a dream spa, as they had state-of-the-art recovery tools (e.g. full immersion ice bath, compression boots, etc). I am so thankful for all the support I have received from my family (especially my parents, siblings, and children for always believing in me, even when I have doubts), training partners (Evan A & D, Glenn, Steve, Marcie, and my many virtual training partners), colleagues (#dreamteam), coach (John Lofranco), personal trainer (Mike Tabour from Afterburn), rehab team (Angela Alexander, Jessica Holland, Colleen McQuaid, and Tara Jackson), and sponsors (River & Trail Outdoor Company, Liv9 Nutrition, and Salomon). Interestingly, I have only participated in a few races where my family was not present along the course, and both times (Sunday and in Africa), my coach was all over the course cheering me on. I am grateful he took the time away from his family to support me and Mel at the race and really feel that he has become part of our family. Thank you to everyone for your support to enable me to train consistently and allow me to pursue my ambitious dreams! I truly felt the support from back home in the lead up to the race and every step of the way. I am enjoying a recovery week, both physically and mentally. I resumed running on Thursday (four days post-race), with daily easy runs lasting approximately 40-45 mins. While we have not yet decided what the goal races will be for 2019, I am seriously considering the Rotterdam Marathon in April. But for now, focusing on spectating my children in their own athletic pursuits 🙂. Off to coach basketball now, gotta run!